Although the global equity indices have been marching higher with low volatility until lately, it has been tough for many Equity Long/Short managers starting late March as the rotation of growth to value began. As a whole the Equity L/S managers have not been able to beat the market with EurekaHedge Long-Short Equity index up 3.2% and Dow Jones Credit Suisse Long-Short Equity index up 3.1% compared to 5.8% of MSCI World TR index and 7.1% for S&P 500 TR, which is not astonishing in bull market. 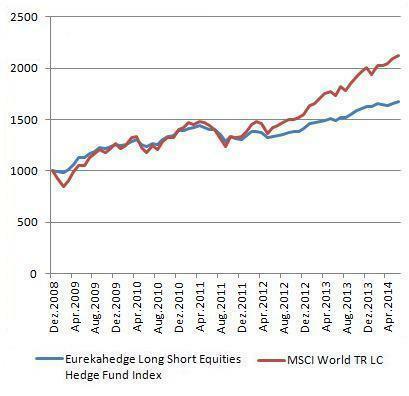 As a matter of fact since 2009 the Equity Long/Short managers haven’t been able to outperform the MSCI World index as they normally have a lower beta (especially for market neutral managers) than traditional long only managers (graph 1). If we look at the attribution of long and short books of the managers, the long book of majority of the managers could easily beat the index, however as the market was trending higher with low volatility, the short book typically suffered as many fundamentally weak companies also marched higher in the QE environment. In 2014 Equity L/S funds clearly outperformed the market in January as most of them had relatively defensive positioning after 5 years of bull markets, however as the market started to rally again in February many managers added more risks especially in growth stocks which then suffered heavily in March and April as value stocks rallied and growth stock corrected massively, which can be seen in their negative performance of -0.63% and -0.70% in March and April respectively while MSCI World continued the upward trends with 0.24% in March and 0.78% in April. Regional managers’ performance has been relatively uneven as Japan L/S manager barely struggled to make a positive return of 0.25% YTD mainly because many fundamental Japanese L/S managers still positioned themselves quite bullish due to the cheapness of the market and the Abenomic reform while many Global Macro managers as well as some Global Equity L/S managers took profit at the end of 2013/beginning of 2014 after a over 50% rally, which caused the market to correct in 2014. On the other hand, North American managers are able to achieve 4.3% during the same period as the S&P went on climbing with good earnings results from American companies. But under the surface, many fundamental growth managers, especially in healthcare and technology sector, suffered heavy DDs as the above mentioned rotation started in March. Besides, the DD on July 31st caused many long biased managers to write negative numbers for July. Except for economic development, investors should also take the geopolitical environment into consideration. As the geopolitical situation gets worse both in Europe and Middle East, we have already seen higher market volatility as many of the European equity managers we observe already wrote estimated negative numbers for July and August. When we look into 2H 2014, we would expect the market to stay a bit more volatile in the near future than the last few years, and the simple beta exposure will be difficult to generate absolute return. And if the market turns more volatile as European economy slows and geopolitical tensions further develop, together with higher interest rate in US and lower liquidity (e.g. average daily volume in NYSE is ca. 1 bln shares/ day in 2014 compared to 2.1 bln shares in 2007), the small/mid-sized niche managers would be more flexible to adjust their exposure and risks accordingly, while the multi-billion dollar funds would have difficulties to change their positioning. On the asset flow side, after a good year of 2013, Equity Long/Short funds are the most demanded strategy according to different surveys. This trend has been verified by the EurekaHedge data which shows YTD until June 2014, the net inflows (excl. performance) into Equity L/S managers is about $52 bln, which accounts for about 80% of total hedge funds net inflow YTD. On the other hand, after 3 years of muted performance, CTA managers lost another $9 bln this year after a flat 2013 and outflow of ca. $9 bln in 2012 (Table 1). Source: EurekaHedge, all numbers in billion USDs, except for percentage numbers. Under current market environment, FERI still prefers small to midsized hedge funds which are specialized in single sectors like commodity or healthcare, and regional or even single country equity long/short managers with local expertise. Typically these managers have specialized knowledge either in the sectors or in the countries which gives them a higher chance of judging complex situations. Importantly however the managers must stick to their capacities as we see too many managers keep raising money and having subsequently deteriorating return. Besides capacity the redemptions terms should also match the liquidity of the underlying portfolio. Although we are not afraid of investing in emerging managers at a relative early stage, they should have well-known service providers to make sure that they are operationally stable. FERI AG is a leading European Alternative Investment and fund of funds advisory businesses. It is based in Bad Homburg, Germany. In its subsidiary FEREAL AG It bundles its activities in the areas of mutual funds, hedge funds, private equity and other alternative asset classes. FERI AG has EUR24bn AuM of which EUR3bn are in Alternatives.